What parts can I save or restore? 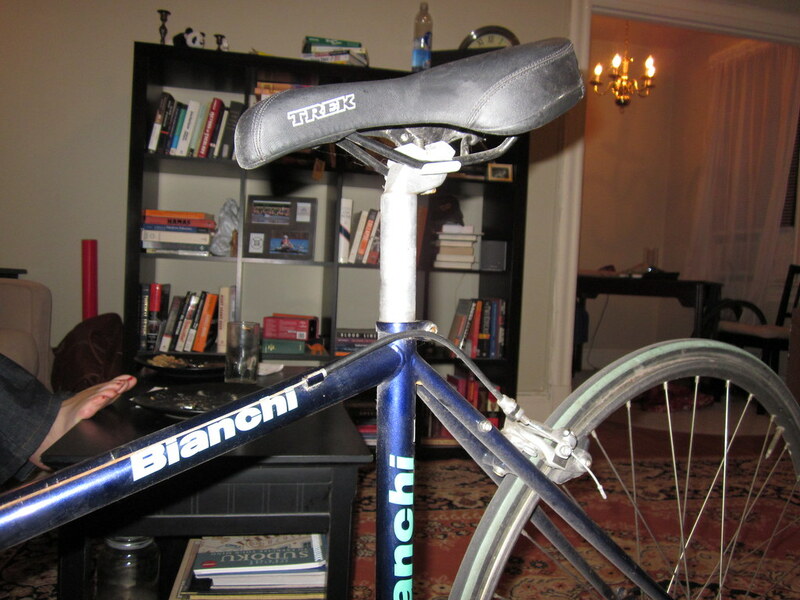 I'm looking to buy a bike on craigslist and he sent me some photos. The frame looks to be in good condition and the rust seems to be mostly limited to the nuts and bolts. 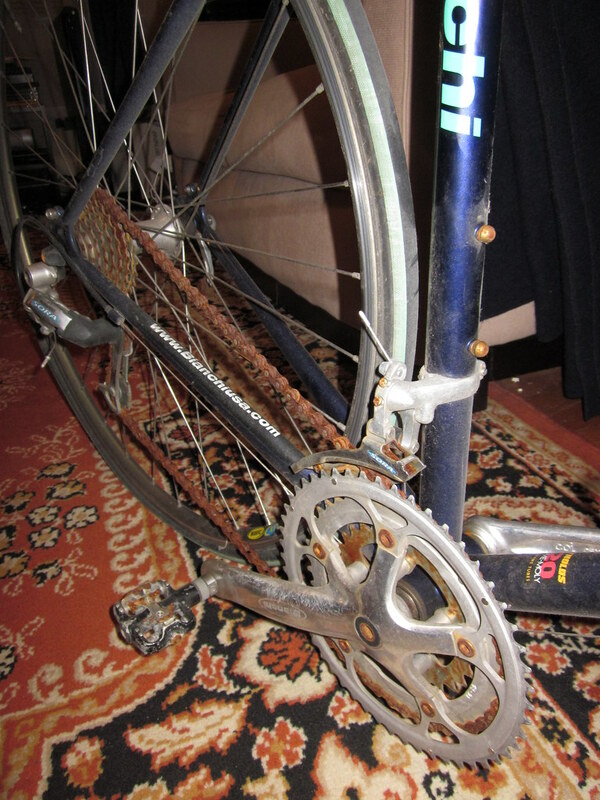 But the crank is rusted, chain needs to be replaced, and cassette I'm unsure about. Fork is unoriginal and is worth more new than what he's asking for the entire bike. What do you all think can be saved? What would it cost to get new parts comparable to Sora? I should add that I kind of want a project, but something manageable since I'm still relatively new to bikes. There is significant rust damage on a hell of a lot of parts. If you want a project, this is NOT the place to start. By the time you finish overhauling that bike you might as well have bought a new one. Thanks for the reply operator. Serious question: what makes you say "significant rust damage"? I'm still green, but it looks to me like the nuts are the things that are damaged the most. Is it usually the case that when a bike gets this bad there is some integral damage as well? Thanks reptilezs. Does this mean that there is structural damage to the frame and/or parts? Do you agree with operator that I should just pass on it? Seller's asking $100 and is throwing in shoes and Profile aerobars and the bike's new MSRP was around $700. Is it still not worth the effort? I've bought trashed rusty bikes before, but I don't think I've ever paid more than $20 for one. That thing is really rusty. You'd be getting a frame, fork, crankset (minus chainrings), wheels, and the bars and stuff. It's certainly possible the steel frame has suffered rust damage on the inside that you can't see. This might be a good project for about $50 if you had some junky old parts to throw on it and ride it as-is. I would not bother buying new stuff for it and restoring it to original working order. I have a bike that looked worse than yours before i cleaned it up, and while its doesnt look perfect, it runs perfect, its amazing what a wash and wax will do. If the stem and post are not frozen in there i say go for it. You really can't tell the frame condition without yanking the seatpost, fork and Bottom bracket and having a peek inside the frame. I go for it if it's cheap. Frequent WD-40 or PB Blaster spritzings on all rusty hardware for the first month you have it before you attempt to turn any bolts or screws on the bike. Scrap the chain, but there's a good chance most of the rest is still useable. The scariest part to me is the fork. Used CF just gives me the heeby-jeebies for some reason. Oooh, price $100 came up while I was typing. Tough call. $50 and a peek down the seatpost and I'd jump. $75 probably. What's that frame sticker say? Reynolds 520? Last edited by LesterOfPuppets; 03-20-11 at 08:54 PM. Looks like a Brava, possibly a 2000 model. MSRP $700, in case you're interested. Fair point. I was looking for an inexpensive project to start, but I might consider looking elsewhere. What I meant by "new" parts was a cheapish, used parts that were in better condition. I'll be sure to look inside if I decide to inspect. It says Reynolds 520, butted. What is the purpose of using WD-40 for a month before unbolting? Can a rusty bolt damage the frame or parts if taken out as is? 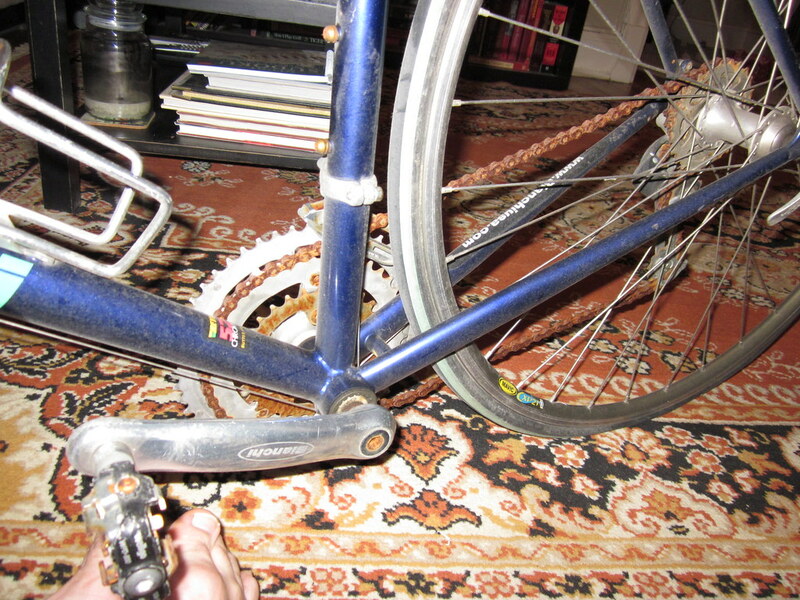 I heard on biketutor to never use WD-40. 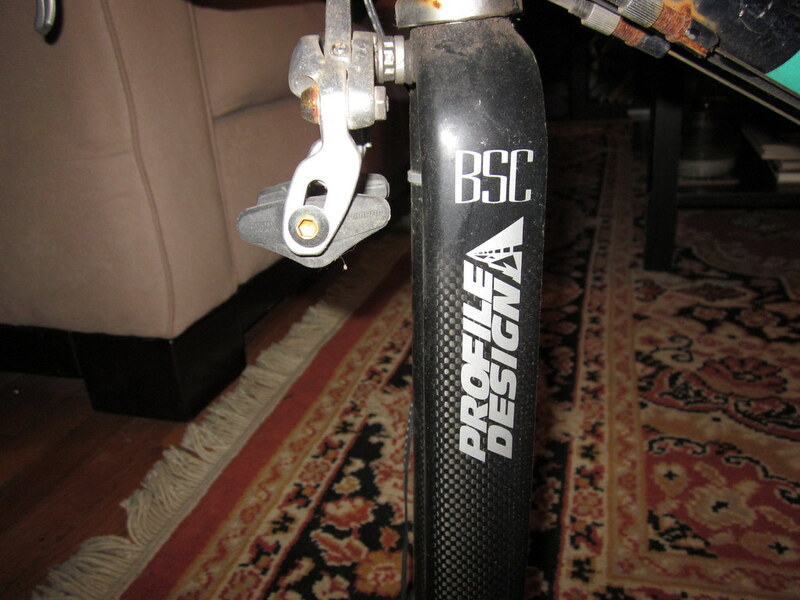 Price includes Profile aerobars and shoes, and the market is DC, which is pretty expensive in general. Everything that can be corroded, is corroded even just from the things in the picture. He should be paying YOU to take the bike off his hands. It is worth nowhere near $100, even if you do decide you want to fix it up - again does not make economical sense. There most likely will be rusted out freehubs, bottom brackets, headset bearings. Basicaly, everything. AND that wasn't a particularly nice bike to begin with anyways. It's sora. That's a $700 MSRP bike when it was new, FFS. Aerobars and shoes don't really sweeten the deal for me. Maybe if you're a triathlete the bars might do something for you. I never get excited about second hand shoes. You really want to give that WD-40 or PB blaster a chance so soak in. It could mean the difference between removing bolts with an allen wrench and removing them with a hacksaw/drill/easy-out. Might damage frame or components if you're not careful. Don't be scared of WD-40 because of what some Canadien on the internet says. Just don't use it as lube, that's all. When you say project, are you buying it as a rider or a flipper? If the latter, definitely pass. Hmmmm. Could operator be the Bike Tutor video guy? He types much more grumpily than he speaks. I was looking as a rider. The comment above was a jab at the DC hipster scene and the crazy prices here. Offer them $20 on the condition that they promise to spend the money on a couple pairs of socks. OK So heres another Canadian suggesting that probably the best thing you might want to save in this deal is .... your money. Condensation happens inside a frame and components as well as outside. With limited experience and probably limited tools - I`d suggest you pass on this one. Some of the other posters here seem to forget that they have the advantage of a lot more experience and a few have well equipped machineshops. This is a good point. I have tons of tools, but none specifically for bikes. I think I'd be most worried about the bottom bracket since I can't even get that off my current, functioning bike. highhung, I bought a second from the bottom of the line-up 1980 Raleigh Record Ace new...then it sat for years while I rode other bikes. I decided to return it to running condition and replaced everything except the frameset, crankset and derailleurs. It wasn't cheap nor practical, but I had a good time and as the Queen of the Fleet it gets the first ride of the year. Now-a-days e-bay and craigslist, along with this forum can be a source of good used equipment. Items that require specialty tools that'd you only need once can be farmed out to a LBS (mine became excited about my rebuild and was invaluable). The frame that I can see looks OK. It's difficult to tell what parts are not repairable. Offer him $50.00. If he doesn't take it keep looking. I have a feeling that despite how awful that bike looks, it'd prolly work just fine after an overhaul. I reckon it's pretty much all just cosmetic damage; there's a chance even the chain would come good with a lube and a bit of use. If there's no rust in the frame, $100 sounds pretty fair to me; it's a half-decent machine. I've only come across one single bike where internal frame rust actually became an issue. Sure, I've seen a few (cup & cone) BBs gunked up by falling flakes, but a clean and a repack would sort that out. I'd check that the seat post isn't stuck though. If I went for it I wouldn't bother with trying to save the chain. KMC chains are a good enough and cheap enough option IMO. Cosmetic damage isn't necessarily a bad thing though. If you have some utility riding in mind you'll probably have to leave the bike locked up in public areas more or less frequently. In that perspective, rust and faded paintwork is a built in theft deterrent. non original fork......no pic of the head tube junctions/may be bent.